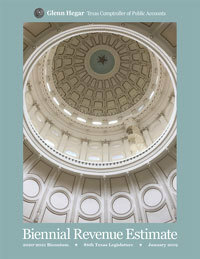 At the beginning of each regular session of the Texas Legislature, the Texas Constitution requires the Comptroller of Public Accounts to submit a statement showing the state’s financial condition and estimating the revenue it can expect to receive through the next two-year budget period. This Biennial Revenue Estimate (BRE) thus forms the basis of each successive state budget. Legislators must ensure total appropriations do not exceed the amount predicted to be available in the BRE.